This weekend the East Troy High School girls volleyball team continued to show just why they are ranked first in the state and a top contender for the state title this fall. East Troy overmatched Menomonee Falls to take the title at the West Bend Lynn LaPorte Sprawl. The Sprawl heads the list of prestigious tournaments in the state of Wisconsin and most coaches agree that it is on the same level if not better competition than that of the WIAA state playoffs. 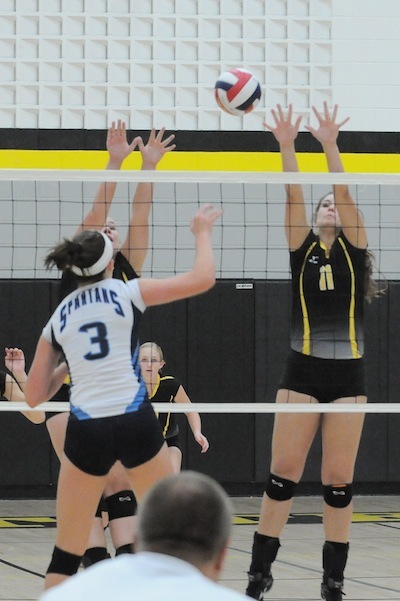 The Trojans began the tournament on Friday Sept. 27, at West Bend High School. West Allis Hale took on East Troy first and took an early lead causing the Trojan faithful to be concerned. The Black and Gold would quickly regroup and make easy work of the Huskies 25-19 25-11. Oostburg, the number one team in Division 3, was next up for the Trojans. East Troy once again found themselves not playing their best volleyball but coming up with big points when the time was right. East Troy downed Oostburg in straight sets 25-19 25-21. East Troy continued its winning ways as they finished day one competition undefeated, easily knocking down Milwaukee Pius 25-11 25-15. On Saturday East Troy was placed into a three-team power pool with defending Division 1 state champion Burlington and defending Division 2 state champion Kettle Moraine Lutheran. The Black and Gold were able to get off to their best start of the tournament as they jumped to a 5-0 lead against KML. The experienced-filled team was able to withstand the hot Trojan start and battle back to tie the match at 15-15 and quickly took their first lead at 18-17 late in the game. Both teams played their best volleyball late and KML found themselves leading 24-23 and one point from the game victory. Out of a Trojan timeout senior Bryzena Santos threw up a huge block and tied the match at 25-25. East Troy would fend off another game point from KML before finishing the set up 27-25. The KML Chargers lost focus after the come-from-behind win and East Troy rolled to an easy second game victory 25-15. Against Burlington, East Troy seemed a half a step slow and fell behind early. The Trojans, never giving in, kept battling strong and closed the score to 15-17. Senior Brittney Jakscht used her short serving specialty to claw the Trojans back. East Troy ended the game up 25-19, closing on a 10-2 run. Once again East Troy was able to close the door on Burlington’s upset bid and easily finished ahead 25-16 for the win, moving them into the tournament semi-finals. West Bend East, the host school, was next for the Trojans. Playing on center court, all eyes were on East Troy as they used aggressive serving and dominate blocking to get out to a large 10-3 lead. The home crowd was silenced as East Troy continued to rollover the host Suns. The Suns, feeding off their large, loud home crowd would not fold in the second game and came out on fire. The hot start seemed to shock the Trojans as their play become sloppy and filled with uncharacteristic errors. Before East Troy could call a timeout, East was out to 8-2 lead. The Trojans attempted to fight back but the large, early deficit was too much to overcome and for the first time all tournament East Troy lost a set, 19-25, and were forced to play a decisive third game. Both teams competing for the finals played even volleyball early. Tied at five points, East Troy started to make their move. The Trojan block, which had vanished in the second game made its presence felt. The Trojans created a wall of defenders that East has no solution for. East Troy ended the game on a 10-4 run, ending the game up 15-9. The championship match would bring a familiar opponent for East Troy as they matched up against Menomonee Falls. East Troy played from the lead before Falls worked themselves back into the match, taking a 19-17 lead. An East Troy timeout cooled off Falls and fought back to earn the first set point of the match 24-22. Falls caught up quickly. With both teams tied at 24, senior Myranda Dallas pounded home a Trojan kill moving East Troy up 25-24. This time East Troy would not squander another set point as the Trojans put an overpass away on an aggressive swing, 26-24. The Black and Gold could sense the celebration to come early in the second set. The set was largely one sided as East Troy jumped out to a 20-11 lead before finishing the sweep 25-18. The win earned East Troy their first Sprawl Championship in school history and kept their record unblemished at 31-0. M.E. Dodge led the Trojans with 65 kills as Brittney Jakscht added 169 assists on the weekend. Mykie Olsen tallied 11 aces and 68 digs as Bryzena Santos rounded out the leaders with 12 blocks. Earlier in the week East Troy continued their dominance in the Rock Valley Conference as they easily swept Edgerton, 25-14 25-12 25-7 and McFarland 25-13 25-13 25-10.